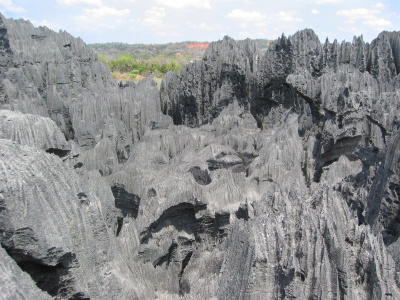 Tsingy de Bemaraha Strict Nature Reserve covers a landscape of limestone karst pinnacles in the drier western side of Madagascar. Adjacent areas with lakes, mangroves and native forest are also included. The park's fauna includes five species of threatened lemurs, and also endemic birds, lizards and rodents. Madagascar is not quite African and not quite Asian, but rather a land unto itself. As the world’s fourth largest island, the country is generally known for its delightful lemurs and bewildering Baobab trees. And while I wanted to meet those lemurs and walk under those Baobabs, Madagascar attracted me for another reason—the Tsingy de Bemaraha. My traveling companion, Herr Kuls, and I landed in Morondava, on the western coast, on a bright May morning. Our guide Patrick met us off the plane, and introduced himself in excellent English. Morondava is a sandy, little place. The kind of beach town that tries to put on a happy face, but is poor and indicative of the difficulties Madagascar faces. We drove directly to our hotel, kicked off our sandals and settled in. Patrick advised us to rest up for the next day. Looking out towards the beckoning beach, we told him that wouldn’t be a problem. The stars were still twinkling when a 4x4 truck picked us up before dawn. Our driver, Monsieur Jackie, was to drive us to Madagascar’s only UNESCO World Heritage Site, the Tsingy de Bemaraha, located approximately 145 miles (235 kilometers) away. En route, Patrick informed us, we would also see the famous “Avenue du Baobab.” Tsingy itself is a collection of improbable limestone karsts, pinnacled (“tsingy”) formations. These dangerously jagged, highly eroded pinnacles form an amazing forest, unlike anything, literally, on Earth. Our journey was to see, first-hand, these distinctive formations and walk inside the extraordinary forest. My pre-dawn thoughts were focused on finding coffee, but an hour later, in the hushed calm before sunrise, we turned off the patchy asphalt road onto a dirt track. As the orangey-light grew brighter we witnessed a scene from Dr. Seuss’ imagination: Baobab trees. Magnificent, tall, and crowned with self-conscious branches, these implausible trees belonged to another planet. I forgot about the coffee. Herr Kuls, the token German, and I laughed aloud at the grandeur of the trees. Like good tourists, we walked the avenue, touched the trees, snapped photos, and once satiated, hopped back in the truck. Fueled with excitement we couldn’t wait to reach the Tsingy de Bemaraha. Although Patrick had specifically stated that traveling to Tsingy would be an “adventure,” and not for everybody, where I come from folks will travel 145 miles to buy a twelve-pack of beer. Herr Kuls and I weren’t dismayed; after all, it wasn’t really that far. Besides, we were in Madagascar, we’d just seen the miraculous “Avenue du Baobab,” and we were ready for anything. Several hours later over difficult patchy roads, we reached an immense river, the Tsirbihina River. Monsieur Jackie and Patrick organized a ferry to take our truck across. We joined the locals aboard, smiled and said bonjour. We were in high spirits. Crossing a river as wide as the Mississippi brings out the Huck Finn in you. Safely across, we loaded ourselves back into the truck and hit the road. Well, not exactly a road. The dirt road gradually dissolved into a grassy path. Monsieur Jackie informed us that the lack of a road indicated that vehicles were not yet traveling after the rainy season. He mentioned that each rainy season the roads fade away. Villages become isolated. Poor people go hungry. Zebu-pulled carts (bullock carts) and walking were the only means of transport. I looked ahead at the expansive savannah and wondered how does Monsieur Jackie know which way to drive? There was no discernible anything, just tall grass as far as one could see. But we pushed on. We had to reach Tsingy before dark, or we’d be stranded. Monsieur Jackie drove deliberately. One false move could cripple us. We were alone with little hope of finding assistance. We carried on. A couple of hours later, I noticed dense clouds of black smoke billowing on the horizon: Fire. “FIRE!” Herr Kuls shouted, echoing my thought. Monsieur Jackie told us to hang on. “Hang on?” I wondered. Our plucky driver grounded the truck into low gear and put the pedal to the metal. The engine heaved and we lunged forward into the raging fire. As if charging into battle, we shouted in unison as we rushed through the wall of flames. Intense heat enveloped us and smoke confused our way. For minutes we drove blinded. Once through, Monsieur Jackie, with a sigh of relief, pulled the truck over. We jumped out and stared at the conflagration behind us. Adrenaline and disbelief surged through us. Too many hours later, over punishing “roads,” and with sore bottoms, we finally arrived in Tsingy at dusk. Along the way we talked about the grassfire, and wondered if seeing Tsingy the next morning would be worth the price we’d just paid. I tried to forget that our diesel-powered truck could have easily caught fire. The next morning we spent half a day exploring the Tsingy. Patrick translated the Park Ranger’s explanations. We asked questions. We snapped photos. We marveled. And then it was over. We returned to our bungalow for an afternoon of rest. Tomorrow we were driving back to Morondava. And all I could think about was 13 hours and 145 miles. 17 Community Members have visited.